One of the things that most people go to Vegas for is to enjoy the exciting nightlife and to party. That’s one of the reasons why the city is so full of amazing clubs and choosing the best ones to go to can be a challenge. If you’re here for a while, you can easily try them all. But, if you’ve only got a couple of days to spend, you need to know the best nightspots to dance the night away. 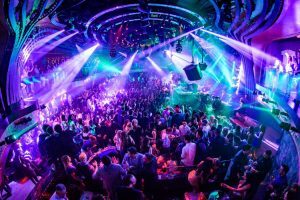 Here are some of the very best clubs Sin City has to offer. Found at the Aria Resort and Casino, this intimate nightspot makes a refreshing change from the enormous clubs that are so often found on The Strip. It’s also impressively opulent, with enormous granite banquettes for VIPs with beautiful leather upholstery for an even more luxurious touch. You’ll also love the enormous double-sided LED screen that syncs in time with the music. Amazing! 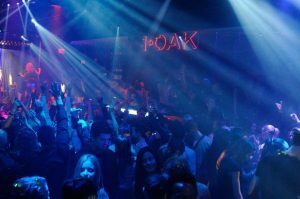 1OAK, or 1 Of A Kind, has a twin club in New York and is a fun spot to spend the night, especially if you love nothing more than getting down and boogying. Designed around a dance floor, this is definitely a club for dancers, but it’s a beautifully designed venue for anyone who can’t get enough of that funky beat. Owned and operated by the same team as Jewel, Hakkasan has its home at the MGM Grand. It offers a completely different experience, however. If you’re happier in a massive club, you’ll love this place – it’s absolutely huge. 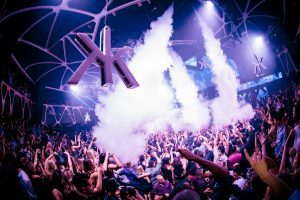 And, because its home to many of the globe’s top DJs, including Calvin Harris and Tiesto, you can expect some pretty amazing sounds. 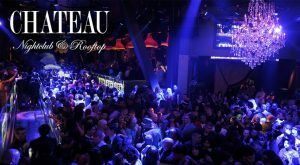 This club is the epitome of cool and offers the ultimate Vegas party experience. 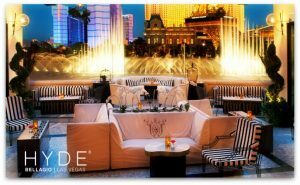 If you’ve always fancied a trip to Europe but can’t quite afford it, you can have a similar experience at the Hyde Bellagio. With its stunning old-world touches and Italian-inspired décor, this place has all the chandeliers, paintings, marble tiles, and books that you could ever want to see. And, since the famous Fountains of Bellagio are just outside, you’ve got bags of European appeal right there on The Strip. If you’re keen for a seriously refined night out, you’ll love the bar’s mixology program with its handcrafted high-end cocktails. 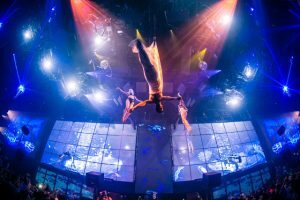 If you’ve ever watched one of the Cirque du Soleil shows and thought what it would be like if those guys hosted a party, you can find out at Light. This Mandalay Bay club offers something a little more impressive than the classic go-go dancers. Here, you get treated to some spectacular entertainment, with themed tableaux, aerial acrobatics, stunning costumes, makeup, and tech visuals that wouldn’t be out of place in a James Cameron movie. You’ll feel like you’re really in the show thanks to the immersive nature of the performances. But, don’t worry! You won’t need to get on the trapeze yourself. So, sit back and have another drink! Found at Las Vegas’ Cosmopolitan, this enormous club has everything you could possibly want or expect from your vacation night out. Separated into several smaller spaces, as well as the main club, there is also the “Boombox,” an intimate smaller space, and the Library. You could easily get lost in this place that offers something for everyone. 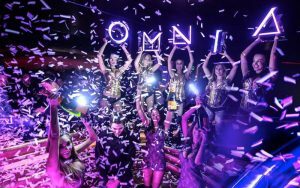 Yet another club from the Hakkasan Group portfolio, Omnia comes from the minds behind Jewel and the self-titled Hakkasan. But, this time, it’s inside Caesars Palace. Opened in 2015, this beast of a nightclub has been impressing the crowds ever since with its seriously futuristic LED chandelier, its mirrored panels, and velvet curtains, and let’s not forget the list of famous DJs who have topped the bill at this party spot. Even better, if you want to go outside to get a breath of fresh air, head to the Patio where you can admire a stunning view of the city. 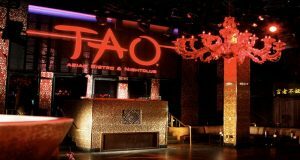 If you love a bit of variety on your night out, you’ll love Tao at the Venetian hotel. Covering a massive 12,000 square feet, this glorious space boasts décor that takes its inspiration from Asia and contains several rooms that all play different musical styles. Whether you love classic dance beats or hip hop, you’ll be spoiled for choice here. And, if you’re suddenly hungry, just pop downstairs and get some amazing eats in the Tao Restaurant, which is just below the nightclub. 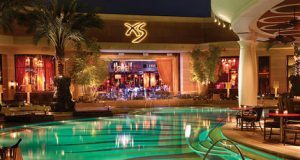 If you didn’t know the XS Nightclub was among the most expensive clubs ever built, you won’t be left in any doubt when you enter through its doors. There’s gold everywhere in this Encore at Wynn Las Vegas venue, as well as golden statues, seriously expensive lighting, and elegant trinkets all over the place. Yet, despite its luxurious appearance, this is a practical nightspot, too, with a big dance floor where you can throw some impressive shapes and an outdoor area where you can head out with someone special to get to know them better. Another nightspot to hit if you’ve always wanted to make it to Europe but never been able to afford to go, Chateau in Paris Las Vegas takes its inspiration from the French capital, with elegant décor and fancy chandeliers. Especially popular with bachelorette parties, Chateau is a great place to head for a fun night. Perhaps the best spot of this club is its outdoor patio area where you can take some time out, breathe in the fresh Vegas air and admire the lovely views over The Strip. If you’re feeling hungry, the Sugar Factory is steps away and is open 24/7. 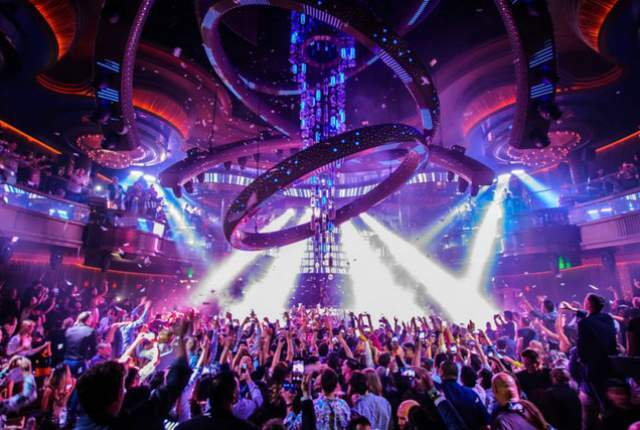 These are just some of the best nightclubs in Vegas. So, if you’re only here for a few days, you are sure to find a night out that really suits your tastes. Get your dancing shoes on and hit that dance floor for a night out you’ll never forget. And, remember, what happens in Vegas, stays in Vegas!